Lance Casey & Associates will serve your legal documents to Corporation Service Company d/b/a CSC Lawyers Incorporating Service located at 2710 Gateway Oaks Drive Suite 150N, Sacramento, CA 95833. Complete the form below, email your documents to me at ljkc916@gmail.com, or fax your documents to me at (916) 244-2636. Call Lance at (800) 683-4769 if you have any questions. Lance Casey & Associates will serve legal documents to corporate registered agents located in Sacramento California. Each entity will receive a proof of service form. Need the total number of proof of service forms. The price is $125 for the first entity. More than 20 pages, notary will result in additional charges. Choose the registered agent that will be served with our legal documents. Upload your file here. 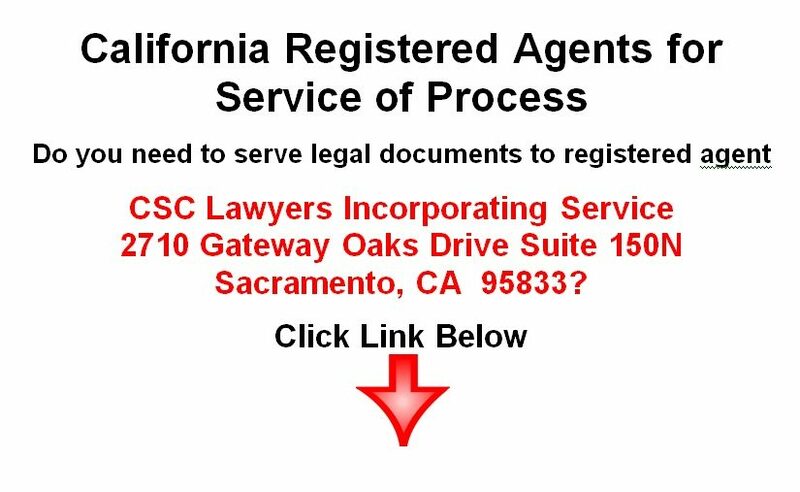 You can email your file to serviceofprocess916@gmail.com or fax your file to (916) 244-2636. How To Pay For Service of Process. You will be contacted via telephone or email and advised the total price to serve the registered agent. An invoice for payment will be emailed or sent to your cell phone. Prepayment is required before service of process.